Home Health & Beauty "Your Face says a lot about your Health"
Area between eyebrows is linked to liver so improper nutrition intake causes spots on these areas. If dark circles have become worse or appear suddenly it evidences that you lack water in your body. Hollow and sunken cheeks show weak lungs and digestive organs, improper nutrition or malnutrition, physical exhaustion and poor endurance. Spots on chin and jaw line indicates hormonal imbalance. 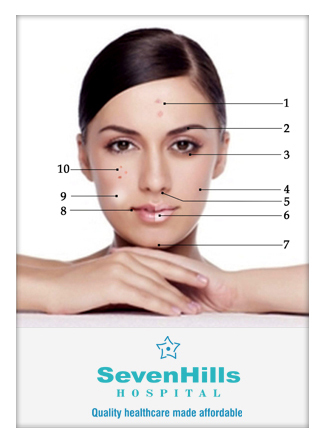 Breakouts are also known to appear on women at some stages of their monthly cycle. Cracks at the corners of the mouth can show Vitamin B2 deficiency, digestive and stomach disorders. White patches on the face may appear due to fungal skin infection. Face pimples may indicate too much sugar & fat. A thin pale and dry upper lip indicates weaknesses of the reproductive system. Eat healthy diet and drink lots of water to avoid liver and digestive system related diseases. Spots can be eliminated by discarding cosmetics that have gone past their expiry date. Reduce the intake of salt and caffeine. Get examined by a consultant on a regular basis. Remember these health conditions may be indicated, and not for certain. Check with your doctor if you suspect problems. Any imbalance in the diet can cause an imbalance in facial features.